Welmon Sharlhorne was born August 17, 1952 in Houma, Louisana and spent more than half of his life behind bars. The fourth of seventeen children, he grew up making a lot of his own toys and entertaining a multitude of children, his siblings and his cousins. At the age of 14, he got into trouble due to a robbery for which Welmon went to juvenile detention for four years. At the age of 18 he got out and worked independently, mowing yards in the affluent areas of New Orleans. Within a short time, he had a disagreement with a customer about what he had earned. The lady called the police to complain and Welmon was arrested. When his juvenile record was discovered, he was charged with extortion and assigned a public defender. This attorney suggested a plea bargained sentence of three years and the judge agreed to this if Welmon would plead guilty. Welmon refused to do this and fired his lawyer. He decided to represent himself during his court appearance. The judge was not amused or convinced by Welmon and he was given a sentence of 22 years at Angola Prison. Welmon had never hurt anyone and yet spent a total of 26 years of his life incarcerated. 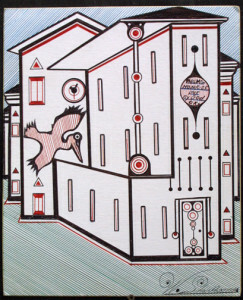 It was at Angola that Welmon began creating distinctive drawings of imaginary buildings, people, buses and skyscapes. Welmon comments, “My art and God saved me while I was locked up.” In order to get materials for his art while in prison, he concocted a story that he needed to write his lawyer, even though he had none, and thereby was given ballpoint pens and manila envelopes. He also used tongue depressors from the prison nurse as a straight edge to form the numerous straight lines his drawing feature. Fantasy plays a big part in his work as well as the symbol of time- a clock included in each of his works. 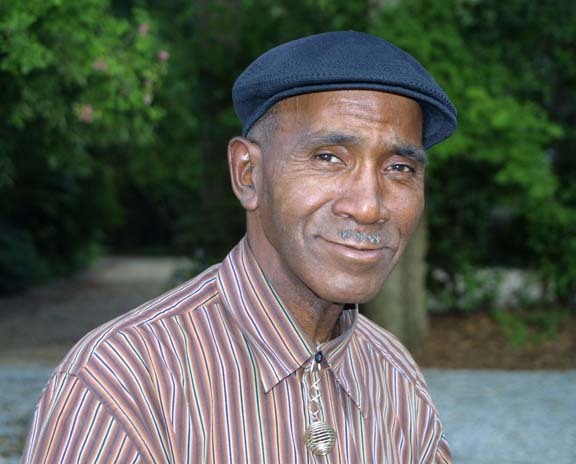 Since leaving prison in 1996, Welmon has spent most of his time homeless and living on the streets of New Orleans. He narrowly survived Hurricane Katrina and was rescued by helicopter from a rooftop. Recently, he has acquired a place of his own and with regular meals has mustered the zeal to create masterpieces of art again. He was able to attend the first showing of his art work in 2009 where he entertained the crowd with his beautiful voice and kind cheerful spirit. A documentary is currently being made about his life and work.